Introduced from Japan circa 1870, Miscanthus sinensis has been grown in gardens for over a hundred years. 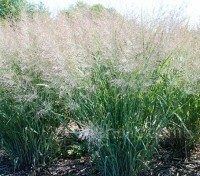 It is one of the best tall grasses for a winter garden. They provide handsome clumps of deep green foliage and airy, plumed seed heads that endure from August until late January. An icon for well over a hundred years, the range of Miscanthus cultivars expanded dramatically in the 1950's when the German plant breeder Ernst Pagels persuaded two of his plants to set seed at the same time. 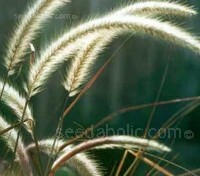 The result of his work has provided us with some of the finest flowering grasses available today. ‘Early Hybrids’ are a selection of early blooming cultivars with differing colours and forms. 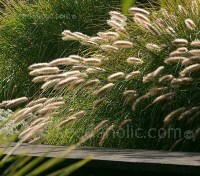 Miscanthus are the queen of ornamental grasses. 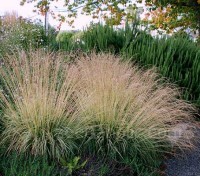 Miscanthus sinensis ‘New Hybrids’ provide a multitude of cultivars with varying heights, leaf widths and bloom times. Some plants will be upright growing and others will have a cascading habit, also expect variation in colouring. Few other grasses have such a great separation between foliage and flowers than Molinia caerulea ssp. arundinaceae. With clumps of arching, blue-green leaves above which the most slender stems and delicate see-through flowers grow to six foot or more. In autumn they turn golden yellow to deep copper. With a unique character and undeniable charm, Molinia caerulea produces masses flower stems that are at first so delicate they are almost invisible, together they form a floating sea of movement. Probably at their resplendent best as summer turns to autumn and their foliage turns a warm butter yellow. 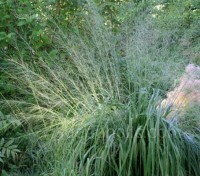 Even people who aren’t familiar with ornamental grasses often know Muhlenbergia capillaris. 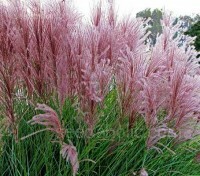 With dramatic arching plumes of soft pink flowers reminiscent of headdresses worn by Vegas showgirls, a large planting of this wonderful grass is enough to stop traffic. The development of bananas is a source of both pride and amazement to those unfamiliar with banana culture. 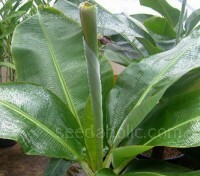 Musa acuminata is a 'dwarf variety' with broad, long, graceful leaves, and is extremely suitable for containers or gardens. 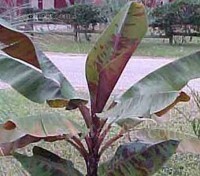 Musa Balbisiana is a fruit bearing variety and one of the progenitors of the present-day commercial bananas. The clumps of lush, dark foliage make it ideal for creating a jungle landscape. It develops large colourful inflorescence of bright red and maroon. 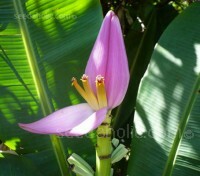 Musa ornata is a very attractive ornamental banana plant with tropical flair. A small plant that produces long, glaucous-green, oblong leaves and a gorgeous purple inflorescence in summer. It makes a much more manageable plant than other species and is extremely suitable for containers and well suited for indoor use. Musa sikkimensis is still a relatively new plant introduction and is proving to be as hardy as the most popular banana species Basjoo, but I think more attractive and quite spectacular as a large plant. 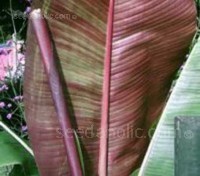 The leaves are a darker glossy green, with new leaves producing a lovely pink flush to the underside. Once you see Nigella in bloom, you will always recognise it by its unique mist of airy bracts and foliage. It earns its common name of Love-in-a-Mist from the tangle of ferny, fennel like foliage that forms a mist around the flowers. Nigella papillosa blooms has deep rich purple stamens that highlight delicate blue blooms and are followed by intriguing seed pods. 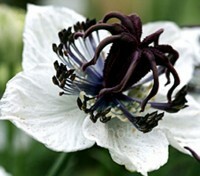 Nigella papillosa ‘African Bride’ is a most attractive variety. Deep rich purple stamens that highlight pure white blooms are followed by intriguing red seed pods. A hardy annual that is very easy to grow, it is rather special as a cut flower, and lovely in summer borders too. 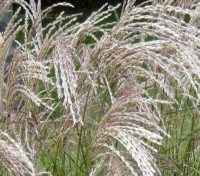 Despite its American provenance Panicum virgatum was originally taken up by German landscapers and gardeners. Renowned for its steely coloured blue-grey to blue-purple leaves, but it is the contrast between the rigid, stainless-steel foliage and purple-pink froth that really charms. 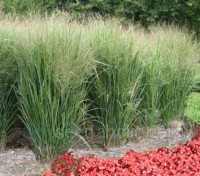 'Emerald Chief' is a good Panicum virgatum selected seed strain. Hardy with sturdy upright deep green growth and great autumn colour. The panicles open red pink in late summer and its foliage turns from green to a lovely deep gold. This chief stands up tall throughout the winter months. Pennisetum alopecuroides is an especially appealing species, it changes its appearance and colour throughout the growing season. 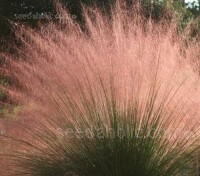 In late summer graceful fountain-like plumes emerge in profusion, they slowly change colour to a blend of green, soft pinks and light-colored maroons before maturing to light tan. Pennisetum alopecuroides var. viridescens has broader leaves and darker flower heads than the regular species and, growing to around 60cm tall, it is also slightly smaller. 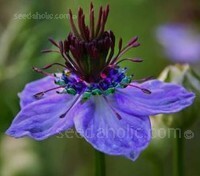 It has graceful smoky purple-black plumes that contrast nicely with the slender arching, glossy, deep green foliage. 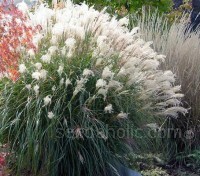 Pennisetum 'Tail Feathers' is a beautiful tussock forming grass that produces an abundance of long, thin, bristly flower heads in summer that start off white and gradually turn to a pale straw colour. Its leaves are pale green on the surface with a silvery underside. 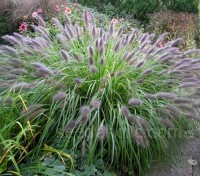 Pennisetum villosum is one of the easiest and most visually stunning grasses to grow. 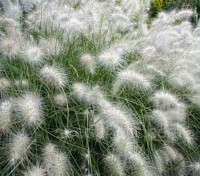 Brilliant white, rabbit-tail spikes are produced in abundance from bushy, clump-forming deciduous plants. Eye-catching and early to flower in borders or large containers. 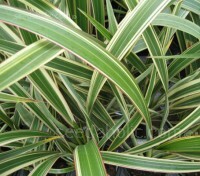 Phormium Mixed species and hybrids offer a variety of colours and forms for the garden. Easy to grow and extremely tolerant of a variety of harsh conditions they provide structure and act as a foil for flowering plants. As an evergreen they add valuable winter interest to the garden. This attractive plant will be equally at home in the flower border or keeping company with the sage and thyme in your herb garden. Delightfully aromatic, the floral-peppermint scent is subtly different from other mints. 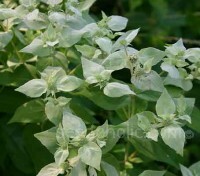 Mountain mint is a great nectar plant, its honey is much sought after. This is a new and rather spectacular version of the Castor Oil Plant. Ricinus communis 'Zanzibarensis' is a fast growing, palm tree-like plant, it sports large green leaves and would be a splendid specimen for the back of the border. 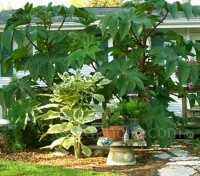 Be warned ... this remarkably architectural plant can grow up to 12 ft tall. 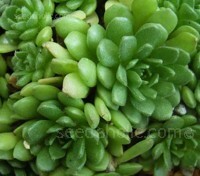 Rosularia is a rosette forming succulent that closely resemble other Crassulaceae such as Sempervivum and Echeveria. It distinguishes itself in spring time when the small green clusters change to a vibrant rich reddish tone. Rare yet hardy, they are seldom seen other than in specialist nurseries or rock garden collections. Sagina subulata is one of the best low growing ground covers. 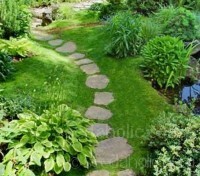 Irish moss is most often used as a ground cover, softening paths and stepping-stones. It gives a lush accent to rock garden and terraces. For a luxurious carpet of green, few plants can match Irish Moss. 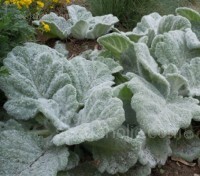 Salvia argentea is prized for its spectacular, large, furry silver-grey leaves. The plants form an attractive mound that provide a dramatic background for colourful summer flowers. It complements purple or magenta flowers and looks gorgeous in a ‘white’ garden.